I have the world's comfiest couch. It's super soft and plush, and is the best place to take a nap on a sunny afternoon. It also reclines, meaning that you can be comfortable doing pretty much anything. I love it. My couch is also almost a decade old. My parents got it for me for my birthday when I was a sophomore in college. It's followed me from Texas to California to Missouri, and seen five different homes and numerous ounces of cat drool. It's a little more rickety than it was in its younger days, the recliner mechanism requires replacement, and the microfiber fabric has numerous stains. My cat walked through some paint, then jumped on the couch. Typical. Taking into account that I wanted a neutral living room in my new home, I can acknowledge that it's probably time to get a new couch. But couches are expensive, and honestly, I love this couch. So I didn't want to replace it. But reupholstering a couch costs almost as much as buying a new one. 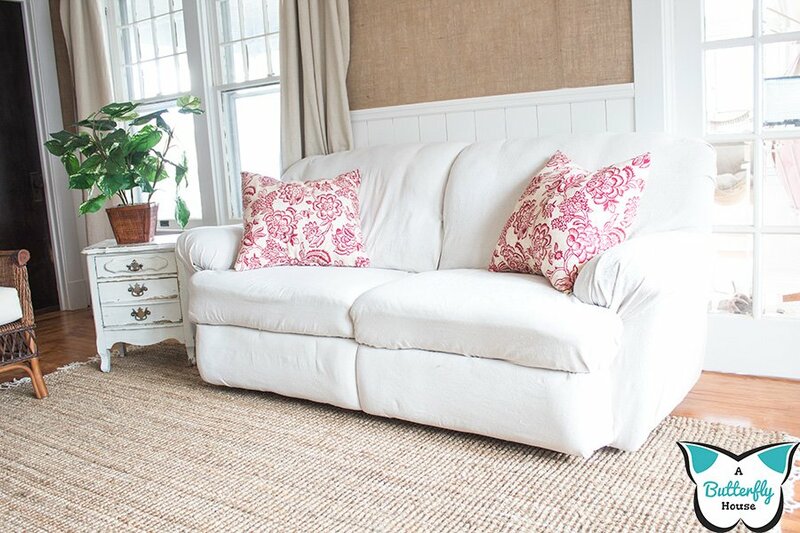 And I couldn't find a single purchasable slipcover on the internet for a recliner sofa, nor could a find a single tutorial for sewing a slipcover for a recliner couch either. And people have googled this. I found numerous forum questions about recovering a recliner sofa, only for no real answer to be given. Since the internet seemed to be in need of an easy way to recover a reclining sofa (and really, couches in general,) I decided to come up with one. Full disclosure: This is kind of a cheater method. We're not sewing anything. 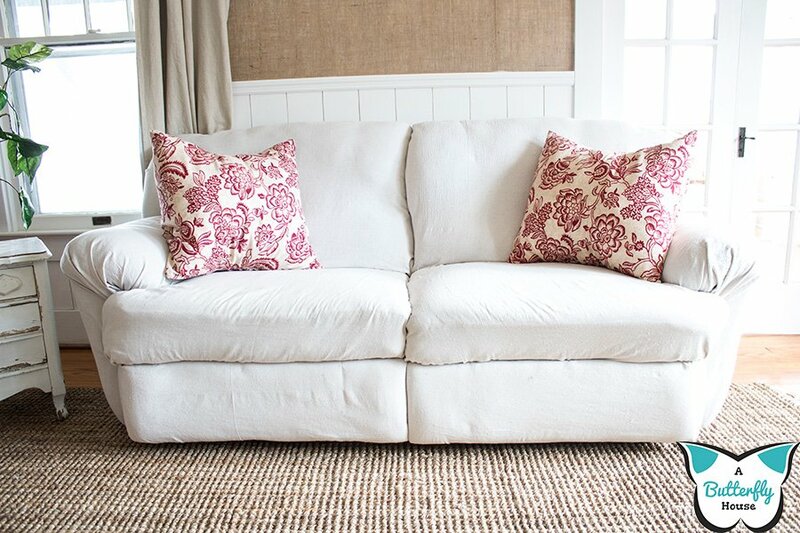 We're not taking apart the couch and reupholstering each piece. We're reupholstering the couch without removing the old fabric. We're securing fabric where we can with brad nails, and tucking the fabric into the folds of the couch in the places we can't reach to secure. That's the quick summary. And it's easy-peasy. Brad Nails and Nail Gun- I used a nail gun instead of a staple gun for a couple reasons; 1) My staple gun takes force from me to expel a staple. Some of the angles I was securing at were awkward, and it was really hard to expel a staple. The nail gun was just much easier to use. 2) It's pretty easy to rip fabric out from under a nail. This is why professionals use staples. But in this case, I liked the fact that I could undo my work easily if I decided to go back to the red. Fabric- I used two bleached 9' x 12' dropcloths to cover my couch, which meant this whole project cost me under $30. But, real upholstery fabric could probably be used as well. I laid my fabric over the back of the couch, tucking fabric into each fold until the fabric was taut. I tucked a lot of fabric, 6"-12" into the folds. Tucking so much fabric reduces the probability that the fabric will come loose. Since the sides of my couch didn't have any folds, I tried to artfully arrange the fabric. Then I secured it with brad nails. An important point here is that much of the structure of the couch is wood-based (wood, plywood or osb). Anywhere where I could feel something hard was probably wood that my nails could secure to. 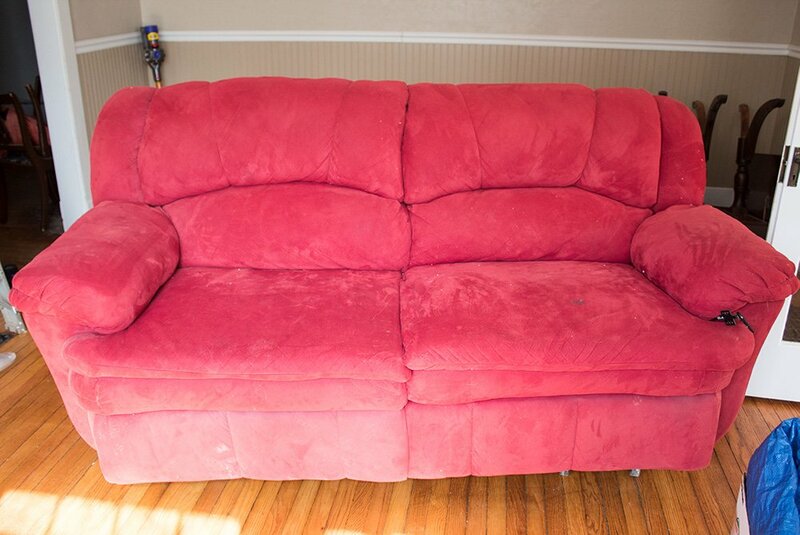 I think most couches are like that, but you might want to check your couch to be sure before starting. I cut my fabric a couple inches below the end of the couch. I only wanted to have to flip the couch over once, so I left that way for a bit. I once again started by laying the fabric over the couch and tucking what I could into the folds. Then I flipped the couch over and cut the side fabric to be the correct length to wrap around the bottom of the couch. At this point, I secured the fabric to the bottom of the couch. I actually used my staple gun here, since I had a good angle and the staples wouldn't be visible. However, the brad nails would have worked as well. I didn't go overboard with the staples, since I knew if I ever wanted to remove the fabric, I'd have to pull each of those staples out with pliers. Once the fabric on the bottom of the couch was secure, I flipped the couch back over and worked on the front of the sides. I once again "artfully arranged" the fabric and secured it in place with brad nails. There's a lot of repetition in the method: I laid the fabric over the seat, and tucked it where I could. Since my recliner mechanism was between the arm and seat of the couch, I made sure that it was still accessible when I was tucking. Then I trimmed the fabric to the correct length, wrapped it under the seat, and secured with brad nails. The footrests were the part most similar to traditional upholstery; I laid out the fabric, cut it , then wrapped it around and secured with brad nails. It took way less time than I'd anticipated- I finished this in less than 5 hours! I'm actually not sure I love it. The fabric bleached just a little too gray, so I'm not sure how well it will fit in my living room. That was part of the reason I'm glad I used brad nails; it will be easy to take off if I decide I prefer the red. The fabric stays in place pretty well, so I thought I'd post this method regardless if I decide to rip it off or not. 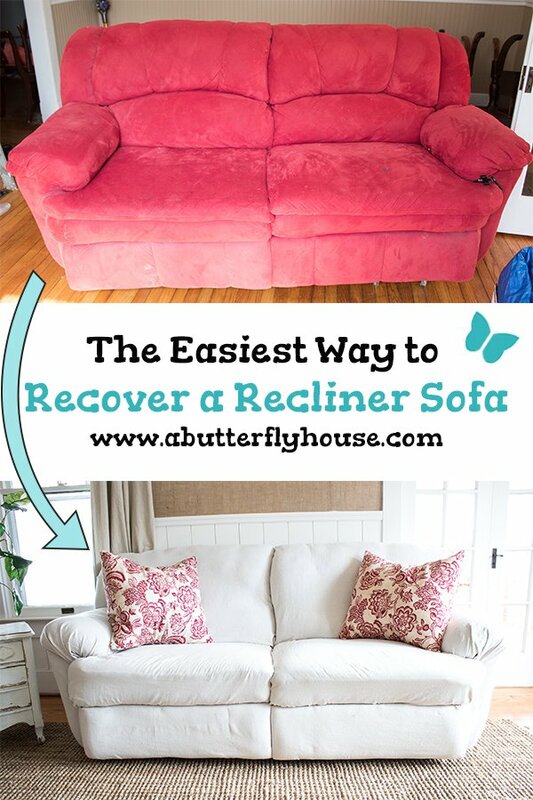 The world is desperately in need of easy ways to recover couches! Especially ways that are so easy they don't require removing the old fabric! Let me know if you use this method. And if you find something else that works, I'd love to know about it! Tell me in the comments below! 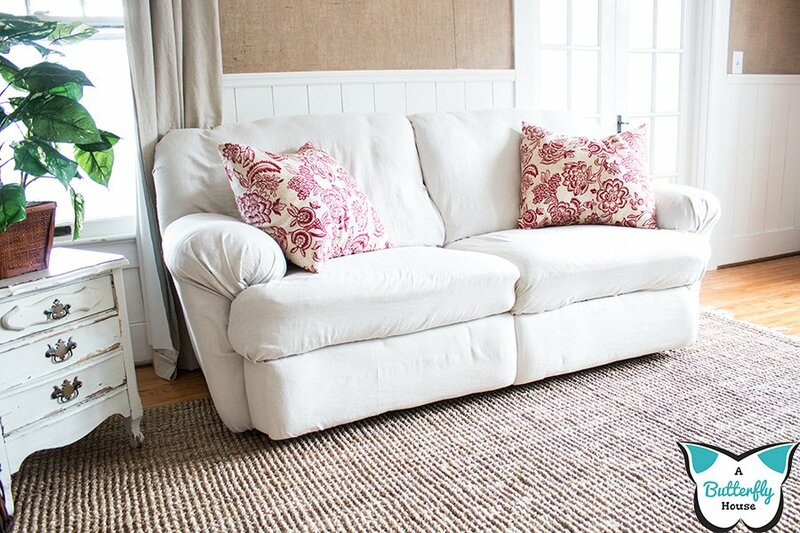 Have a reclining sofa? Save this to Pinterest so you can find it later!